Caring for Kids and Teens is a comprehensive online publication that offers health information, safety tips and other information that can help enhance the health and well-being of children in Summerlin and the Las Vegas area. Robert Wilkinson, DO, is the Medical Director of the Pediatric Emergency Department (ED) at Summerlin Hospital. 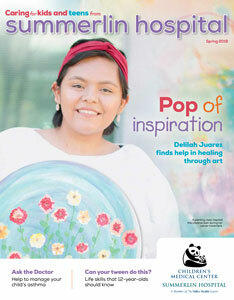 While Delilah Juarez was being treated for osteosarcoma, her creative spirit continued to soar. According to the Centers for Disease Control and Prevention (CDC), approximately 6.2 million people under age 18 have asthma. Prepare your pre-teen with capabilities that are sure to boost their confidence.